What if you can’t see the crowd naked? Then I went home and freaked out! I’ve never painted live before. I paint in a methodical style that takes hours not minutes. I didn’t know if I could produce a piece of art that would fit with my current body of work. I didn’t know if that was a big deal. Was it even possible to produce a finished painting in 10-15 minutes? I had no choice but to find out. Back in the studio I set up my paints to practice. Live painting seems spontaneous to me so I thought it made sense to paint intuitively during practice. 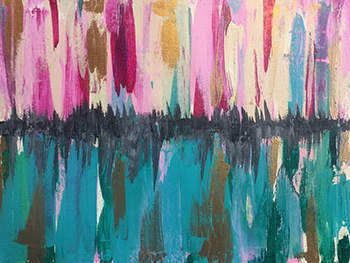 In case you are wondering, intuitive painting is a creative practice that releases impulses usually corralled by the logical part of the brain to make a work of art. People who use this technique employ their intuition to paint automatically without stopping to plan for the outcome of the piece. And I hated it! In fact, I can’t believe I am showing you these paintings because they embarrass me. These paintings seem so amateur. I left my practice session deflated and wondering what I would paint. I spent many nights lying awake in bed because my brain couldn’t solve the conundrum. The Japanese paper MaryLea gave me as inspiration. Before I had my next practice session at the studio I met with artist MaryLea Harris. I was borrowing an easel from her for TEDxBend Women and I had to pick it up from her house. When we met I shared my frustration and fear. She completely understood my anxiety and showed me beautiful things in her studio to inspire me. 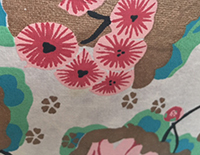 She sent me home with a piece of handmade Japanese paper with pink flowers and gold, green and blue accents. MaryLea also very casually said, you could always use a technique like this, and she dropped a few splotches of paint on the table and ran a credit card over them. The next day in the studio I met with musician Rylee Chiyo McConnell for a live practice session. As she was setting up her upright bass I prepared my palette with colors inspired by the Japanese paper. 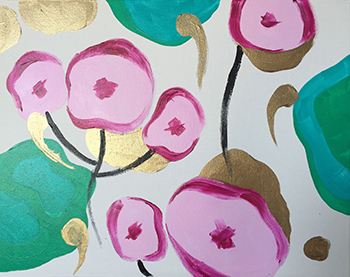 As Rylee played “Sunshine” by Norah Jones, “Fix You” by Cold Play and “One More Day” by The Wood Brothers I painted pink flowers with fuscia accents surrounded by green and blue cellular shapes with gold accents. After the first set Rylee realized she needed to add one more song so we could fill 15 minutes. As she was looking for her song I was looking at my piece thinking, “I hate it, I hate it, I hate it!!! !” I needed to do something different. But what? The first painting from the practice session with Rylee. Rylee picked “Gravity” by John Mayer to add to the set. When she was ready to practice round two I decided to try painting completely abstract this time. I remembered the credit card paint swipe MaryLea showed me and I let that technique guide me through the entire painting. When we finished I was so happy I fought back tears. I finally knew what I would paint on stage – two days before the live performance! The second painting from the practice session with Rylee. Painted with a credit card. The day of the TEDxBend Women performance I was so nervous. My back was toward the audience so I couldn’t even imagine them naked to calm my nerves. I had to carry my easel onto the stage and I was worried I would trip. The stage was small so I was worried I would take a step back and fall into the audience and embarrass myself. Of course none of these things happened! My hand was a little shaky at the start of the performance but the credit card technique was forgiving. My first live painting experience was awesome! 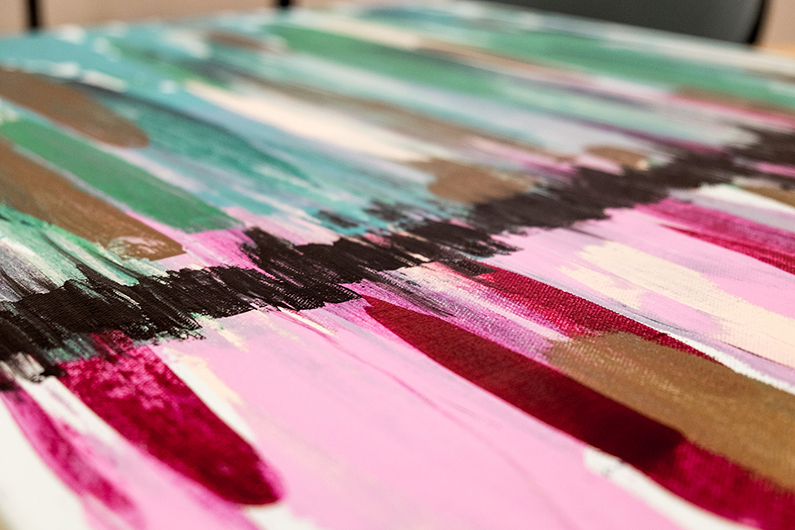 Click here to see the finished painting and more live painting photos from TEDxBend Women. TEDxBend Women live painting photo courtesy of Veronica Bahns Photography & Design. Way to go Lisa and way to say YES!!! It’s awesome and so are you! Thanks MaryLea! I couldn’t have done it without you!